Tim came to yoga in 2006 after struggling with multiple herniated disks in his lumbar spine for many years prior to starting his yoga practice. Tim has been physically active his whole life and played multiple sports growing up. He had always thought that playing through the pain was part of the game. Yoga has helped heal his wounds and brought strength and balance to his life. He continues to play golf on a regular basis and is a huge fan of the Kansas City Chiefs and Royals. 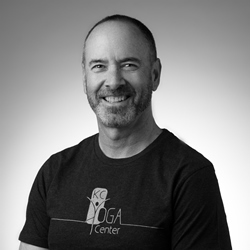 Tim completed his 200 hour yoga certification with Kansas City Yoga Teacher Training in 2015. He completed Katherine Roberts' Yoga For Golfers® certification levels I & II in 2016. He enjoys teaching basic and Vinyasa flow classes and looks forward to working with students to help them grow their yoga practice. Tim has worked in the fresh produce industry for over 35 years and is currently working for apple/pear and cherry growers in Washington state. He enjoys traveling around the country setting up advertising and sales programs together for retailers all across the United States. I came to yoga after suffering with low back pain for many years. I was living on pain medication and shots but nothing seemed to be working to help alleviate the pain for any extended periods. I was always an athlete growing up and have a regular golf practice, which suffered greatly from the back pain. At the urging of my wife I began a regular yoga practice instead of the last resort which would have been surgery. I have now been practicing for over 12 years with little to no pain. I have greater overall energy, have built up my core, leg and upper body strength and feel great. I took my 200 hour teacher training with the Kansas City Yoga Teacher Training in 2014. Lead teachers are Angie Eckenroth, Leah Morgan, and Kelly Colln. I have been teaching regular Vinyasa Flow, Heated Stretch, Heated Vinyasa Flow and Vinyasa Basics since then. I also completed the Yoga For Golfers program in Scottsdale Arizona and am a Certified Level 2 Yoga for Golfers instructor in the Kansas City area. I love showing students what the regular practice of yoga can do for their heath. To me a regular yoga practice is a journey into building strength of body and mind. I enjoy teaching all levels of classes from the very hardest level 2 flow to the slowest deep stretch classes. Every person, no matter what age, shape or size can benefit from a regular yoga practice and their lives will be better for it.